Denne Apen blir du fort glad i.
etterhvert som om han 'Lever'. Sjimpansen ser skremmende realistisk ut. - FÃ¸lger bevegelser med Ã˜ynene & Hode. - Meget naturtro mimikk & Kropsbevegelser. - Detekteret forandringer rundt seg. - Lager forskjellige lyder i henhold til sitt humÃ¸r. (RC = Styring fra Fjernkontrollen). - Hode reagerer pÃ¥ bevegelser. lyden kommer fra, og reagere pÃ¥ den. - InfrarÃ¸de Syns-sensorer & Ã˜yne som blunker. Passer for alle fra 8 til 80 Ã¥r. Drives av 4 x D Batterier eller 6Vdc Adapter (FÃ¸lger med). MÃ¥l : 31 (H) x 20 (B) x 21 (D) cm. mood specific animations and sounds. tracks objects and reacts to human interaction. Touch sensors in his chin, head and ears. Stereo sound sensors detect loud sounds. 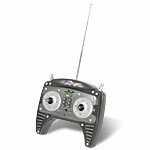 Visual and sonic guard mode. but it didn't take any time at all before we'd all become very fond of him. 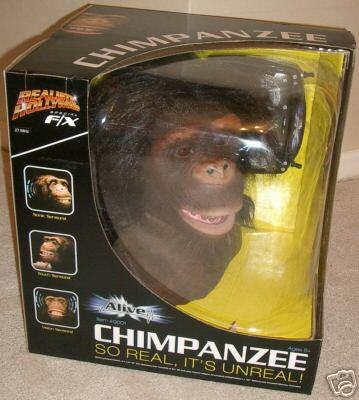 and boy is he lifelike. movement in front of him using the infrared sensors in his eyes. and his emotions change as a direct result of his treatment. (he chuckles enchantingly when you tickle him under the chin). When left alone he re-enters default Curious mode. which will take him out of Alive mode and into your hands. 20 moves into him to re-play at the touch of a button. looking around him and behind from time to time. this analogy's falling apart before our eyes). outside of a Hollywood movie. 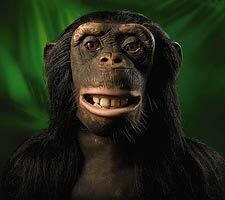 but it's made us all strangely fond of Chimps now. Go figure. 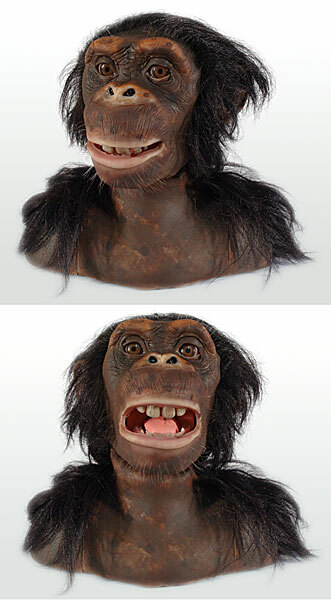 Freakily realistic-looking Chimpanzee head with remote control. 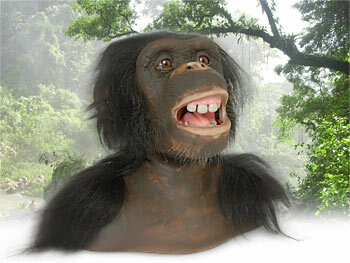 Stereo hearing so your Chimpanzee can detect and react to sound. Sonic sensors and touch sensors located on the ears and chin. following anything that moves in front of them. The chimp has five modes : Guard, Alive, Demo, Sleep and Program. (not included) for the remote. Size: 30.3 x 29 x 21cm. 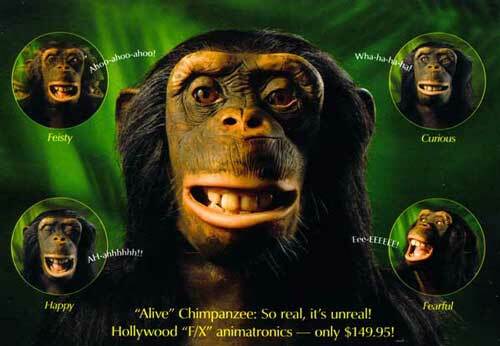 technology dedicated to making machines that look, sound and act like real animals. under $ 200 â€” the first high-quality animatronics robot ever designed for home or office! intelligently with you, your family, your guests...and with baffled strangers. sound sensors; his skin reacts to contact with touch sensors all around. â€” appropriately reflecting his emotions. and (depending on what he encounters) his mood can change. Use the controller in "Program" mode to select whole sequences of action. as far as 10 m away. 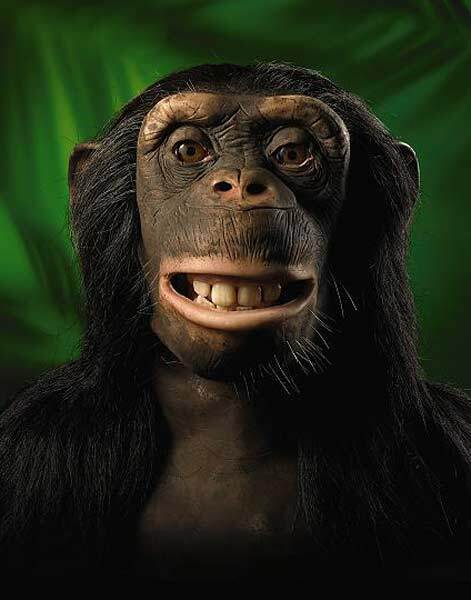 anything to trip his sensors: When someone enters the room (for example), your "Alive"
Chimpanzee will begin whatever series of actions and vocalizations you programmed. Ages 8 and older. 90-day warranty. Worldwide first edition is available exclusively from Arngren.